Discussion in 'JS Plugin Releases (RMMV)' started by Quxios, Jan 2, 2017. When you find a bug / get an error or crash. Report it here or as a github issue [ https://github.com/quxios/QMV-Master-Demo/issues ]. I would prefer github because it's easier to track. When reporting include the error that it shows on the console log (push F8 to open the console) not the error that shows on the game! Also include any extra information that lead you to that crash so it will be easier to recreate. Slight0, cedr777, RainbowGrenade and 30 others like this. Oh ops, all the links are linking to old repo. Will fix! @sefeloth Thanks for letting me know! I'll add it in a minute. And it should be just '%test-Actor1', not sure why the %25 is showing. Panning is disabled by default. Enable with the `pan` plugin command option. I was going to add plugin parameters to set default options, but I forgot! Will include in next version. It would look better if I had sprites with real poses to showcase it better. But that's how it is. You can also see my next plugin QCamera, in that video. You'll notice the scrolling doesn't keep the player center, it lags behind a bit. Though I did notice a bug when doing that. When changing from a QSprite back to a normal sprite, it still plays the idle pattern. 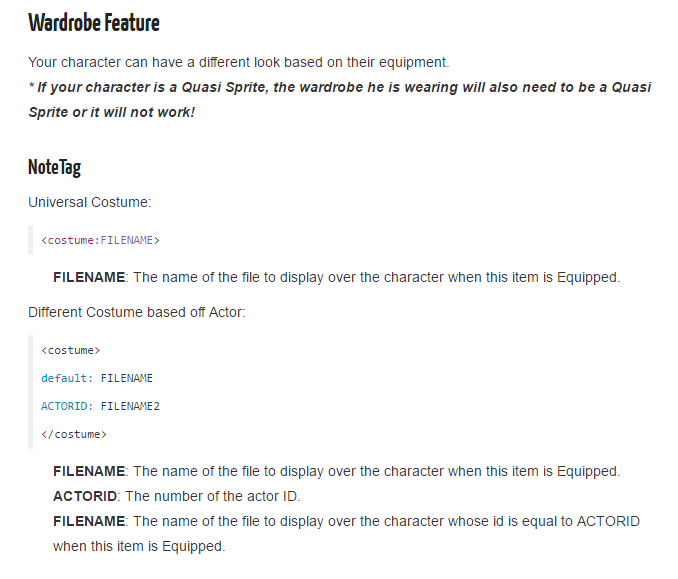 @sefeloth Make sure you have the QSprite plugin enabled. And open the console with F8, to see if there's any errors. From the looks of it, QSprite plugin isn't loading for you. You can also just redownload the demo, and paste it again. Because I just tested it from a fresh demo install, and worked fine for me. sorry, i forgot i disabled that plugin because i thought it had something to do with the previous problem. it works fine. these are cool plugins by the way! Panning is enabled by default now. To disable panning add the `noPan` option. Fixed bug where if you change out of a QSprite, it still plays the idle pattern. luiscesjr and Anisoft like this. The QAudio plugin does not work when deployed to Android. there is no sound being emitted, no error happens, there is just no sound. @luiscesjr Do you know if that happen with all audio types? I'm not sure I got what you meant Quasi, but I tested, making a normal event and started playing the audio file I want to be played using Qaudio, and it plays. On android the only file type that get transferred is the m4a, is that what you meant? Using Android I can't test with other formats unfortunately... But on play test it works, since it loads the ogg file, and the plugin reads it. I guess maybe this is the problem? I haven't looked into the code, but could it be only loading the ogg files? But looking into that, it looks like that will never be true. Because inside that 'shouldUseHtml5Audio()' it will only return true is 'Decrypter.hasEncryptedAudio' is false. So it's basically checking if Decrypter.hasEncryptedAudio is true and false. One thing I can think of testing ( besides testing all the audio types, so dont just test bgm, test se, me, ect) to see if none of them work ( just to narrow down the issue ). Also try playing only 1 qAudio. Because each time you call the qAudio function, it filters the buffers. also is there a tutorial for how to use quasisprite? How to use the app is also in that same link. Oh I see, sorry, it's a BGS, a 1 minute and 12 seconds BGS file, in m4a format. I will try testing the Qaudio with other sounds, default rpg sounds, etc as you suggested. Will post back the results soon! So I tested it with se, bgm, bgs and me. None of them played. I tested those same audio files using events on other test maps, they play and stop normally. Same thing, during playtest on pc the Qaudio works and when deployed it does not. @luiscesjr I'm not sure then, sorry. Do you mean deployed for windows? Because when you brought this up, I tested deployment on windows with encryption and without. Worked both times for me. Just making sure, since you said "on pc" but didn't say what it was deployed for. But I'm assuming for android. But asking anyways just in case. Using new getArgs function from QPlus. Lets you use "s around a audio name if it has spaces; Ex: if file name was Some File, add it into the plugin as "Some File"